Small drums and tambourines. Because your kids are small, drums they can handle easily, like the ones pictured above, are best. They can be frame drums, which are hand-held, small floor drums, drums with mallets, like lollipop drums, or even small bongos. I’d stay away from drums with fiberskin heads because while they sound great, don’t hold up to being hit with mallets, which is what your children will want to do. Shakers. Shaky eggs are a favorite because they can be easily held by babies. Small maracas are great, too. Plastic ones hold up better, but wooden ones do sound better. Some wooden shakers are shaped like animals, which are fun for children. Stay away from big, adult-sized maracas. They are too heavy and cumbersome. 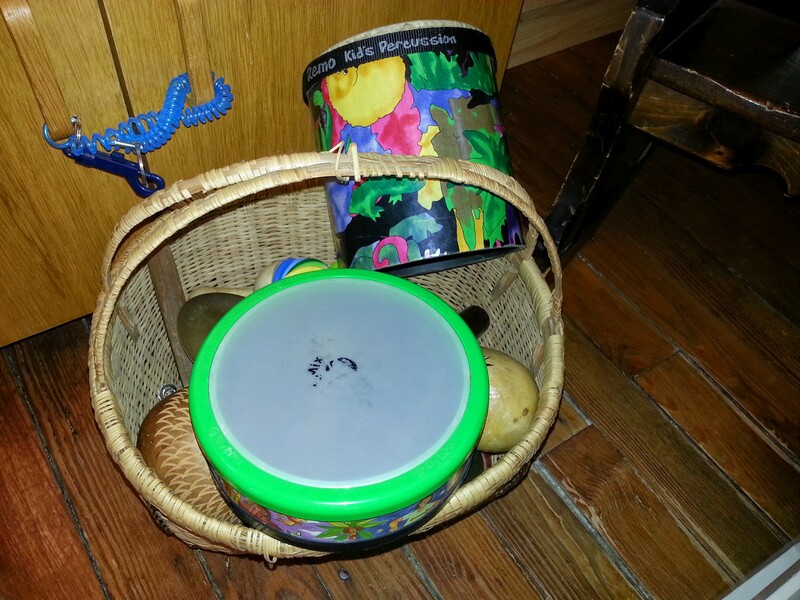 Castanets, tone blocks, and small hand-held percussion. There are so many different kinds, and they can usually be found for a couple dollars a piece. Kokorikos are a lot of fun. Rain sticks and be a fun and beautiful addition to music time. Movement props. Scarves and streamers fold up and can be used in many creative ways by children while they dance. I really like using rubber bands, like the ones on my West Music wishlist, so that we can stretch and move the music together as a group. Props for singing. Toobaloos and kazoos can help children find their singing voices, as well as puppets, or even play microphones. Books. In order for children to become accustomed to seeing musical notation and connect it with the music that they make, they need to see it and have it be around the house. The Wee Sing series is great at providing notation, pictures, and CDs to sing with. Sing the songs and look at the music in the book, just as if you were reading words to your child. Do you have favorite instruments in your collection at home? If so, let me know which instruments you or your children just couldn’t live without!